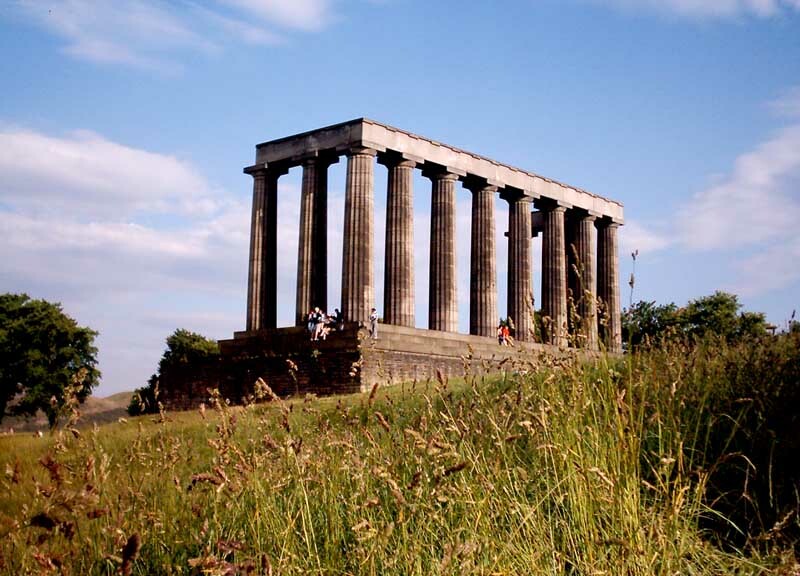 Work has begun on restoring the National Monument on Calton Hill. 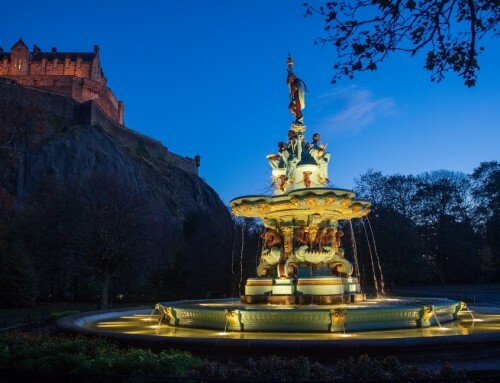 The project is part of the Twelve Monuments Project, a joint initiative of Edinburgh World Heritage and the City of Edinburgh Council which is restoring some of the city’s famous statues and monuments. Scottish servicemen who died in the Napoleonic War, and funds for its construction were raised by a public appeal. Work started in August 1822, but only the twelve columns we see today were ever completed. The biggest challenge is to move one of the enormous stone lintels at the top of the monument, which over time has shifted out of position. This will be lifted back into place using crane and new lime mortar added. The top of the monument will also be investigated to see if more stonework repairs are needed. Areas of crumbling mortar on the base of the monument need to be replaced with new lime mortar, and weeds and bushes will be cleared away from the base of the stonework. 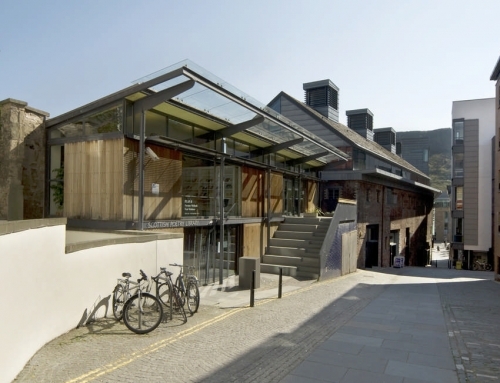 The work is expected to cost around £78,000 and is due to be completed at the beginning of December 2008. 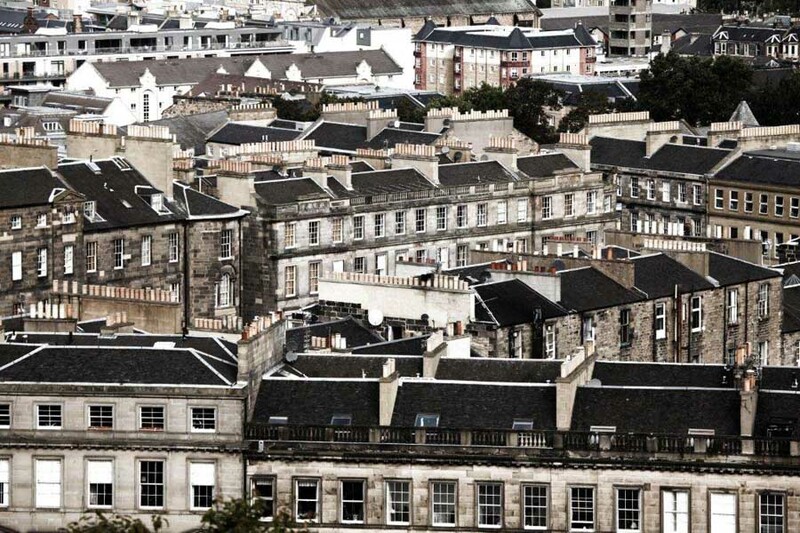 The work is being funded by Edinburgh World Heritage and the City of Edinburgh Council, with contributions from the Binks Trust and the War Memorials Trust. 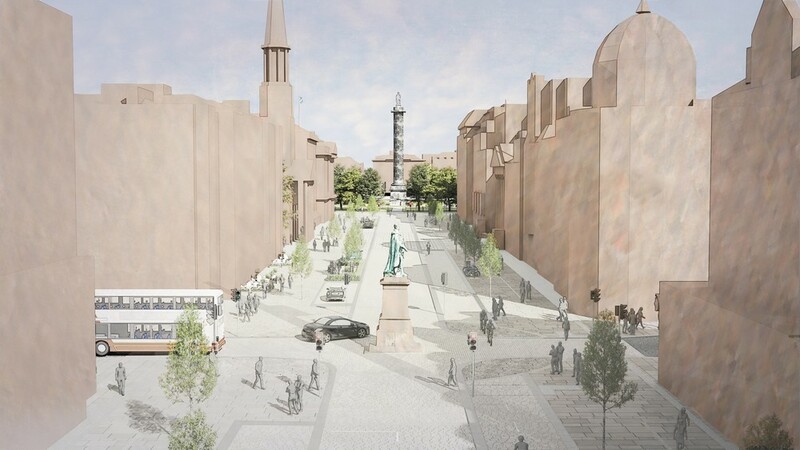 The Twelve Monuments Restoration Project is a three year programme expected to cost around £1 million, funded by EWH, the City of Edinburgh Council and a variety of other sponsors. 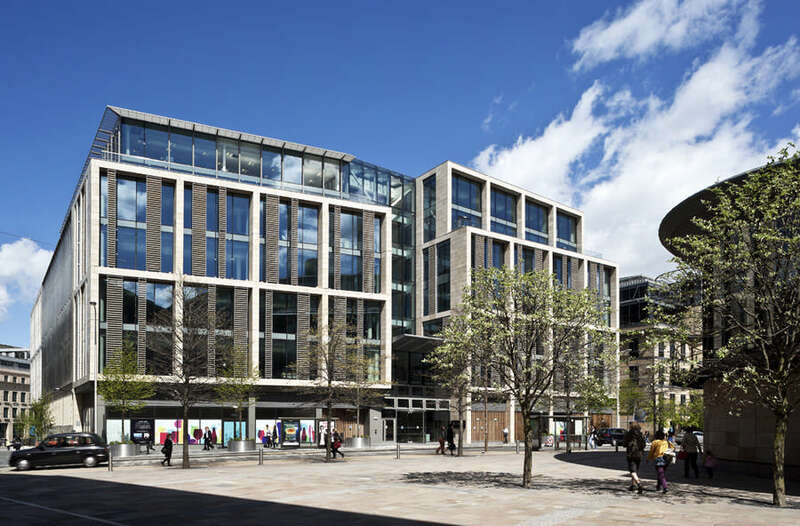 Already completed are the Black Watch Memorial on the Mound, the Buccleuch Memorial in Parliament Square, the Melville Monument in St Andrew Square and the Bow Well in the Grassmarket. 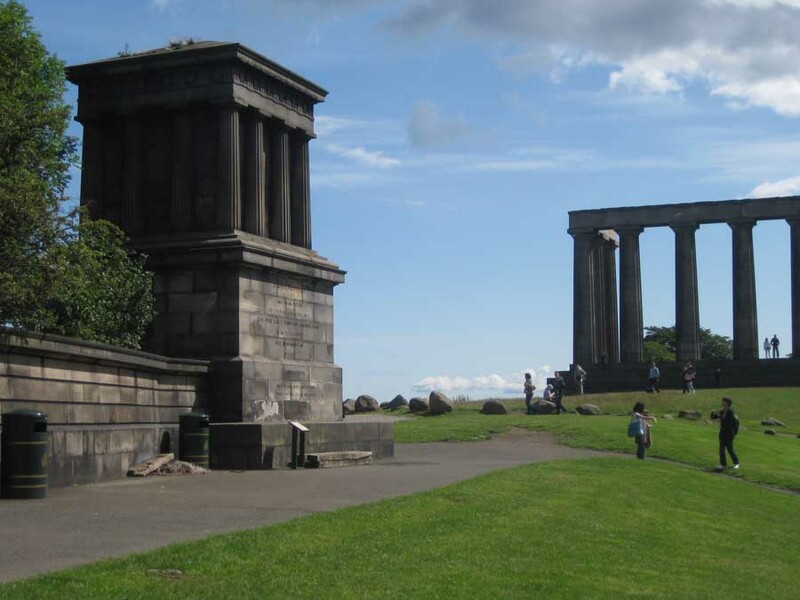 This year the focus is on the Calton Hill monuments, also including the Nelson Monument. 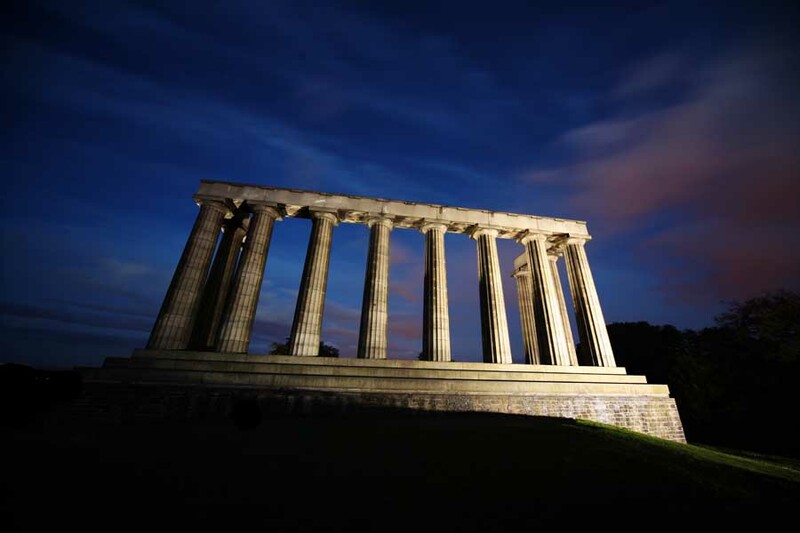 The idea for a National Monument was first aired at a meeting of the Highland Society in 1816. Charles Robert Cockerell was appointed architect for the monument, and William Henry Playfair was taken on as his assistant. The Duke of Hamilton laid the foundation stone in August 1822. 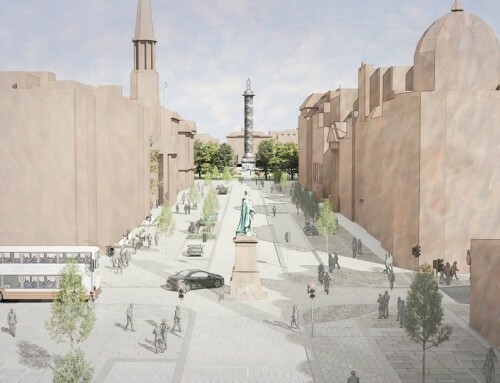 It was decided the monument would take the form of a National Memorial Church, to commemorate Scottish servicemen who died in the Napoleonic wars. It would also serve as a National Mausoleum where illustrious Scotsmen would be laid to rest in the catacombs. 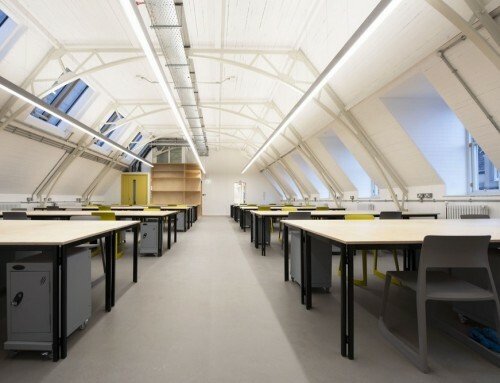 It was estimated that £42,000 was required. 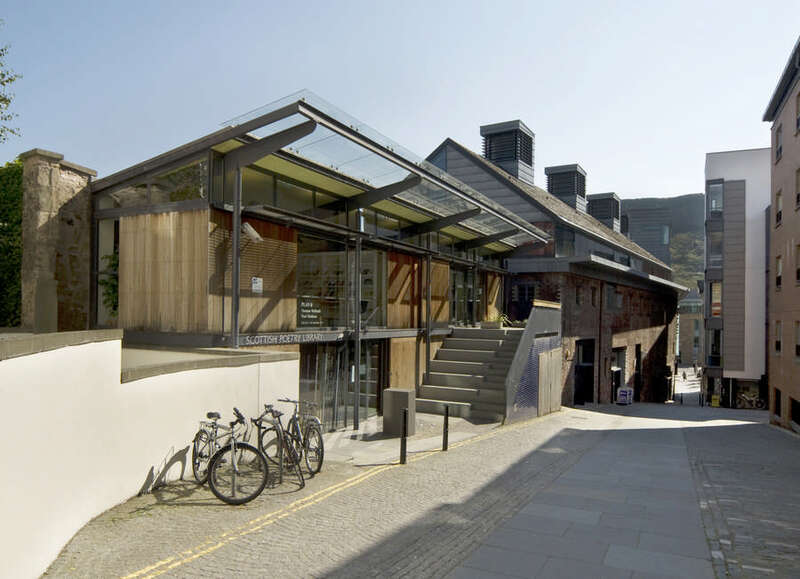 The subscription received the support of many eminent people including George IV, the Duke of Atholl and Sir Walter Scott, but after 16 months only £16,000 had been raised. During the first phase 1826-29, the twelve pillars cost £13,500, and due to the lack of further funds the impetus was lost. 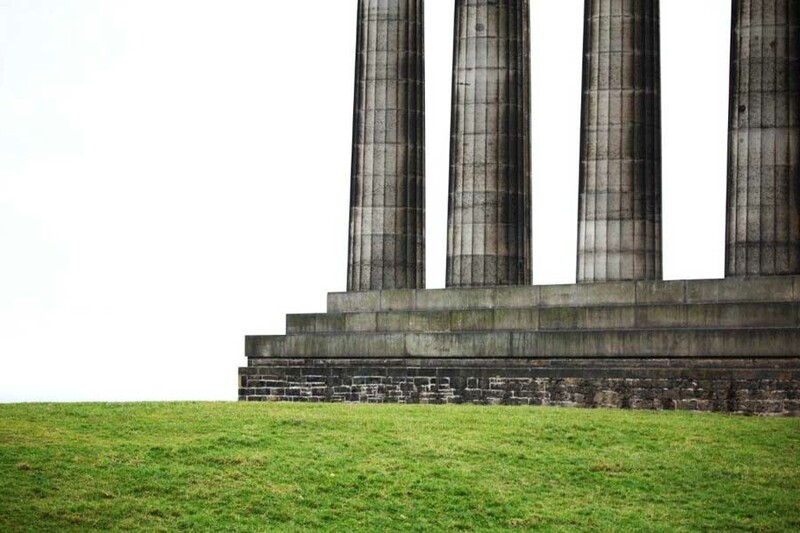 As it stands today, the twelve massive columns National Monument on Calton Hill is clearly an imposing structure. The design is based on the Parthenon at Athens. Some of the largest pieces of stone ever taken from the Craigleith Quarry in Blackhall were incorporated. Since 1829 numerous proposals of varying credibility have been proposed for the National Monument’s ‘completion’ and use. 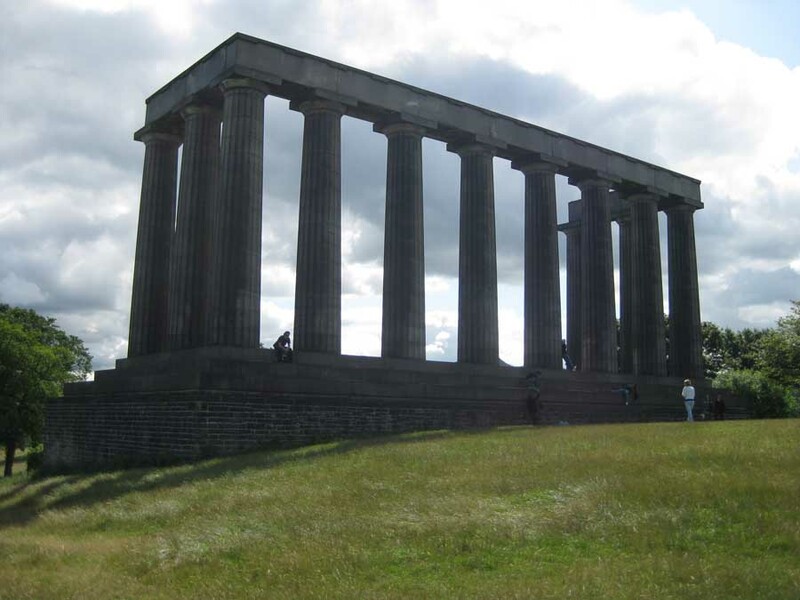 Edinburgh’s (actually Scotland’s) National Monument was apparently designed as a folly (though this has been questioned), based on Acropolis, Athens – not the result of lack of funds (though see penultimate paragraph). Playfair’s plan shows just 12 columns. Built as a National Monument to the Napoleonic Dead, £24,000 was raised by a committee for its construction. Drawings only show exactly what we now see, so the architect C R Cockerell and his assistant William Playfair intended the incomplete appearance. The National Monument was intended to be a memorial to those who died in the Napoleonic Wars. It is a potent symbol and can be seen both from Princes St and silhouetted from the East such as Gosford Bay near Longniddry with the Castle framed between Calton Hill and Arthurs Seat (recommended viewpoint). Designed by an English proponent of the Greek Revival architecture, C R Cockrell, The National Monument project was assisted by a young William Henry Playfair who was to go on to complete even more successful works. C.R. Cockerell’s most famous building is his St George’s Hall, Liverpool which features in most Books covering British Architecture. 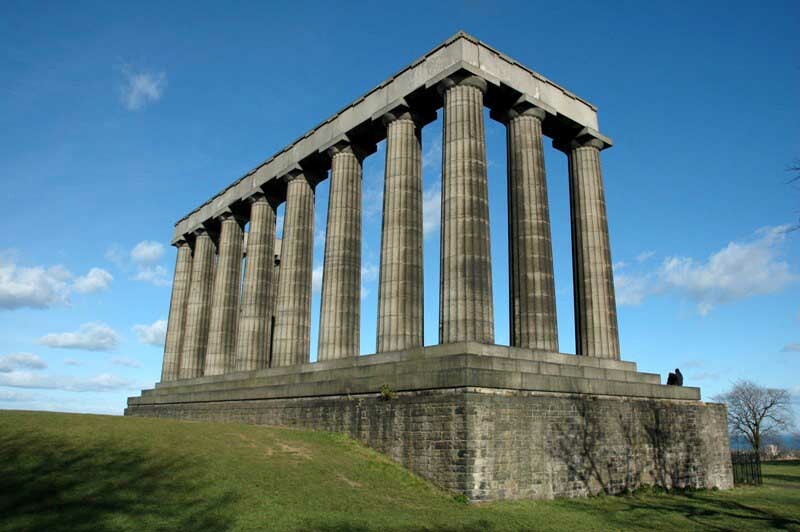 The Monument foundations were laid during the visit of King George IV to Edinburgh in 1824. Work came to an end in 1929 when the money provided by public subscription ran out – due in part to the ambitious scale of the monument. 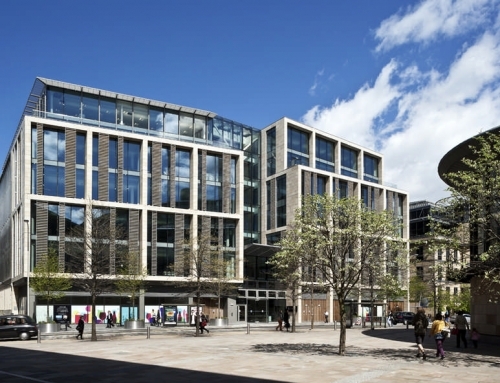 While it has been suggested that the architect had deliberately designed only 12 columns of the National Monument, it was later to be described as “Scotland’s shame”. 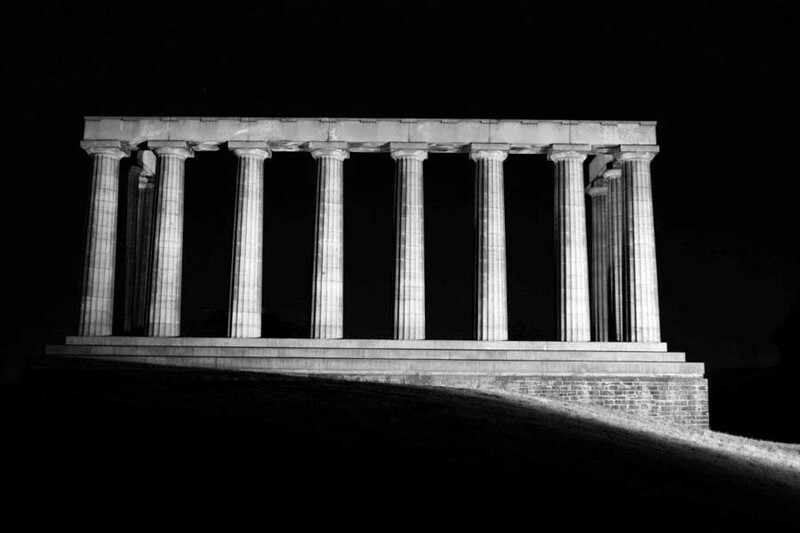 The prominent Grecian columns of this and other buildings in Edinburgh has led to Edinburgh being described as the “Athens of the North”. Scotland shared with France a strong involvement in the Enlightenment and this was often esposed in architecture through Greek Classical language. 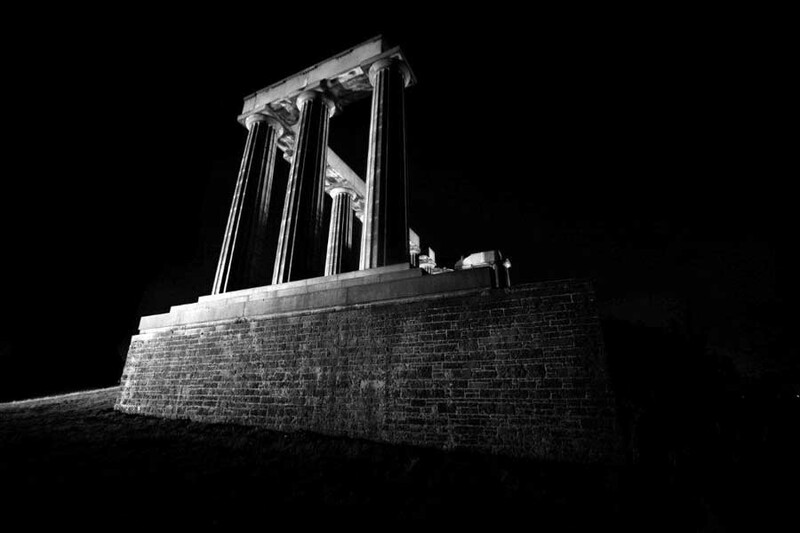 Perched high on Calton Hill, near Playfair’s National Monument, at the cast end of the city centre, is the monument to Admiral Lord Nelson’s victory, and death, at the battle of Trafalgar, on 21 October 1805. The upturned telescope was designed by the architect Robert Burn, and built between 1807 and 1815. In 1852, a large time ball was introduced, which is lowered as the one o’clock gun is fired from Edinburgh castle each day. Climb the 143 steps to see the tremendous views, framed by Fife to the north, the Forth estuary to the east, the Moorfoot hills to the south and the Forth Rail and Road Bridges to the west.